Trey Gowdy leads the Benghazi Select Committee: The South Carolina Republican wants to put the White House on trial. The South Carolina Republican leading the Benghazi select committee was made for the job. Rep. Trey Gowdy’s inquisitions, especially about Benghazi, can expand to include every fact he wants known. For once, Rep. Trey Gowdy had no questions to ask. It was Sep. 19, 2013, well into a full day of House Oversight Committee hearings on the 2012 attack on the American consulate in Benghazi. The morning had been spent on the facts gathered, then and later, by the State Department. After that the panel heard from the family members of victims—from people like Patricia Smith, whose 34-year old son Sean had been killed in the attack. Patricia Smith was transfixed. She had not come to Congress expecting to hear low country poetry about her son. But here it was, spooling out on C-Span, and here came more of it. Smith finally interjected, forgetting to use her microphone: “Get answers, please!” Gowdy said that he would. It was the most compelling moment of a day that the White House was largely able to ignore. And it was resonant in a way that Chairman Darrell Issa’s post-game response—to tweet a photo of empty Democratic chairs in the room, as if the other party had taken a respite to spit on some graves—was not. This is one of the reasons that Gowdy, who’s in his second term representing the areas around Spartanburg and Greenville, South Carolina, was chosen to run the upcoming Select Committee on Benghazi. As many as 206 Republicans reportedly want roles on the committee. None have suggested that Gowdy shouldn’t run it. To conduct hearings that may lead to impeachment, Republicans needed a leader who seemed unimpeachable. They needed someone exactly unlike former Rep. Dan Burton, who never lived down a demonstration, involving a watermelon and a gun, of how Vince Foster’s “murder” might have gone down. That’s barely hyperbole. In 2010, Gowdy got to Congress by humiliating Rep. Bob Inglis in a Republican primary. Inglis, panicked over the damage done when he voted for the Wall Street bailout, attacked Gowdy, and charged him with ethics violations. That background began when Gowdy was 28, bored, and working at a private practice. He got a phone call, “right after lunch” one day, telling him that a family friend had been shot dead. Of course, the impression of disarray worked to Gowdy’s advantage. After he took over, the South Carolina Court Administration revealed that two-thirds of the circuit’s cases were half a year old, or older. “I am embarrassed to have the second-oldest backlog in the state,” Gowdy told the press. Right from the start he was building a reputation for taking ice-cold cases, and for knowing precisely how to handle a local media that wanted details of crimes. 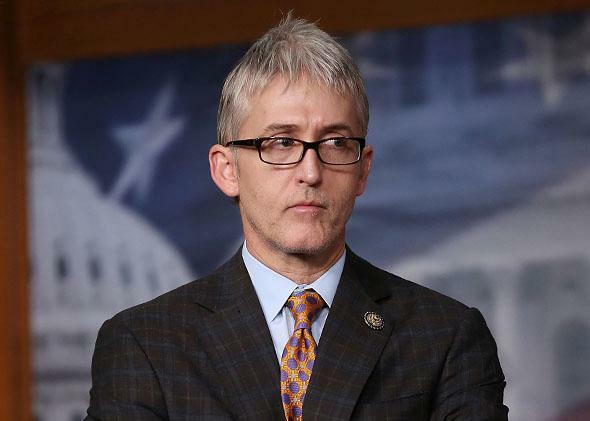 Gowdy has hardly changed. He delivers floor statements and press conferences, which tend toward tedium, with the passion of a losing argument. (One video of Gowdy deriding the administration over Benghazi got 2.2 million views on YouTube, probably for the way he stalks to and from the podium and throws down notes that he hardly seems to need.) In hearings, Gowdy sometimes refers to the Oversight Committee as a “jury.” At the most recent Benghazi hearing, on May 1, he accidentally started to call Issa “your honor.” He turns any room, temporarily, into a courtroom. The snark ran out, and Gowdy got to the question. “What evidence did you have that this was an escalation of a protest rooted in spontaneity that got out of control and resulted in the murder of four of our fellow Americans?” he asked. “There was none,” said Lovell. It was a perfect answer, coaxed out by a passionate reminder of how they were discussing not just talking points but the lives of Americans—Americans Gowdy had promised to honor in their deaths. It was also, as Armed Services Committee Chairman Buck McKeon would prove, one of very few useful answers. Lovell was there to contradict the official, investigated story that the military did everything it could to get resources to Benghazi. “BG Lovell did not serve in a capacity that gave him reliable insight into operational options available to commanders during the attack,” said McKeon. But Lovell could confirm to Gowdy that the false story of an escalating protest did not come from the military. That was Gowdy’s point—however many days passed since the attack, he would put together a narrative that explained who lied. And this makes him hard for the Obama administration to immediately dismiss, though it’s trying. Issa, in the White House’s view, was always a wounded figure whose repeated histrionics have gone nowhere. It wants Gowdy to be seen the same way, as a dispenser of cornpone and grenades who will run a show trial. Actually, in the media tour that started after he was picked to run the committee, Gowdy has relied on his “trial” metaphor. He’s stuck by a claim of “evidence” that the Obama administration scrambled to hide relevant facts. “If an administration is slow-walking document production,” he said on MSNBC’s Morning Joe, “I can’t end a trial simply because the defense won’t cooperate.” Gowdy only talks about Benghazi the way he’d talk about a re-opened murder investigation, a case given to his courtroom because somebody else screwed it up. He’s good at this. Republicans, who can imagine the select committee lasting through the midterms and into a lame duck president’s final years, are clamoring to be in his jury.